It would be a dream for any golf enthusiast to live amidst the thrill and excitement of the golf course. For those who are considering to buy a home in Charlottesville golf communities for the first time, there are a number basic things to consider. If you’re among the many hopefuls to follow the steps of successful owners of golf homes, here are some ideas to get you on track. Green is definitely a color you’d expect to see surrounding a Charlottesville VA golf home. Aside from the greenery, make sure to include in your considerations the view surrounding your potential golf home. Are the windows facing the sunset or the sunrise? Is there a magnificent view to see first thing in the morning after a good night’s sleep? Golf homes are known for their amazing surroundings that you don’t want to miss out on this. Many of our golf communities have golf front lots located along the course. These lots may be priced with a premium, but many golfers desire a home with a view of the course. Consider whether you will want a view of the tee box, green or fairway. Make sure that you’re getting the view you want because you will surely spend plenty of time in your splendid home. It would be such a delight to have a view to greet you any time of the day. Similar to owning a Charlottesville horse farm, you need not isolate yourself from civilization. You will need a number of supplies and items for your golf home. You will need certain items delivered to your doorstep. Most of all, you would absolutely love to have guests over. Consider the location of your potential golf home. Is it accessible? Are the roads leading to your golf home easy to find and follow? How far will it take you to get to the hospital in case of an emergency? Having an unbelievable home surrounded by nature and fantastic views does not mean you have to sacrifice other conveniences in life. Each of our Central Virginia golf communities, is in a different location and I am sure that there is one that is close to your favorite shopping spots. You will be exploring outside your golf home as well. Many golf communities offer additional community amenities. Find out if your future golf home has access to such amenities. Swimming pools, tennis courts, fitness centers, clubhouses with dining and more are just some of the basic amenities that would definitely make your life in your golf home even more enjoyable and exciting. These amenities provide awesome opportunities to socialize, be active and become more of a part of the community. Charlottesville is indeed home to many of the best and most beautiful golf communities across Central Virginia. 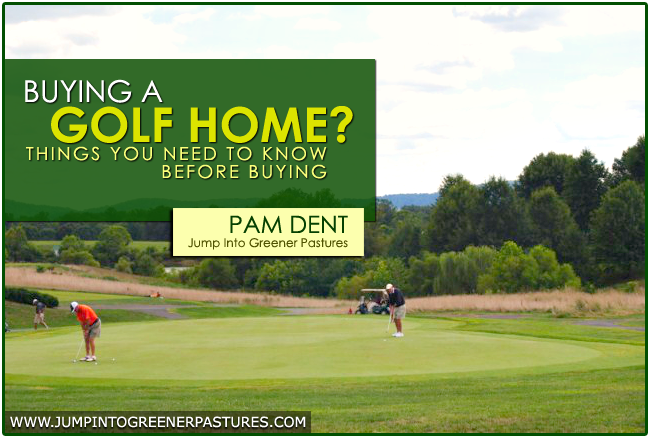 For more ideas and guidance in choosing the perfect golf course home for you and your family, please visit my website today at www.JumpIntoGreenerPastures.com. Call me, Pam Dent today at (434) 960-0161. I have the professional and expert knowledge on Charlottesville real estate, the local housing market, horse farms and golf communities that will guide you through the exciting journey of finding your dream home. Albemarle County and Central Virginia are noted for some of the most beautiful scenery in Virginia. Many Charlottesville homes boast beautiful gardens and meticulous landscaping. However, as we become more ecologically conscious we need to learn how we can create a beautiful home environment while saving our natural resources at the same time. One way to preserve the local ecosystem is to landscape with indiginous Virginia plants. There are several ecological benefits to using native species of trees, shrubs and flowers in your yard. Since native species evolved in the local ecosystem they are adapted to the area’s climatic conditions and as a result are likely to use fewer resources to stay healthy. Native plants are developed in the soil of the area so are less likely to need fertilizer and are more likely than alien species to require pesticides as they are probably resistent to the insects that are in the area. In addition they will be more drought resistent than a plant that is native to a wetter climate. For a list of plants that are native to the Piedmont Region of Virginia click here. I was surprised to read today in an article published in the Fredericksburg Free Lance Star titled Edison Did It Right: Put The Lines Out Of Sight that when Thomas Edison first started supplying electirc lights to New York City the lines to his customers were run underground. It was only later as power expanded into the countryside that lines began to be run above ground. As you know in many areas of Virginia you can see unsightly metal towers carrying power lines. Land that is in proximity to these lines can have decreased value. You may have heard reports of the controversy in the Norther Virginia and Pennsylvania area over the proposed high power lines to support the increased use od power due to internet usage in the Beltway area. These unsightly lines will cross some of the most beautiful farmland in Virginia forever spoiling the natural beauty of the area. Not only are below ground lines a good choice to preserve our rural beauty and also our rural land values, but also the additional cost of burying the lines can be weighed against the reduced maintenance and protection from storm damage of the underground lines. Underground lines are the best choice for our Virginia countryside. Lets all work on Keeping Virginia green! Charlottesville, Virginia and Albemarle County have many choices of green-built and Energy Star homes and I would be glad to help you find the one to suit your needs. The state of Virginia and Charlottesville are focusing on ways to become more environmantally friendly. Last week the Virginia Commission on Climate Change announced the finalization of a plan for the state to reduce global warming by 25 percent during the next 12 years. During the coming week across the nation localities will participate in Local Climate Action Week. The focus will be on persuading the federal government to give money to support local areas efforts to reduce climate change. Read more to learn about the week’s events in Charlottesville. Many Charlottesville homeowners are trying to make their homes more eco-friendly and save energy at the same time. One of the ways the save energy and lower our utility bills at the same time is to make some simple corrections to our home's water systems. One of the first steps is to lower the water temperature in the hot water heater to 120 degrees. Each 10degree reduction in hot water temperature can save 3-5% on your yearly hot water bill. At the same time lowering the water temperature can prolong the lifespan of your water heater. Insulate your water heater by wrapping it with an insulating blanket. This will pay for itself in less than a year and can reduce the energy use of your heater by 4-9%. Install low flow showerheads and faucet aerators. If you reduce hot water use you will naturally reduce the amount of energy used to heat the water. These features can actually reduce the energy used in heating water by 50%. Insulate your hoet water pipes whenever they are located where you can access them. This will save energy while keeping the water in the pipes warm at the same time. Fix leaky faucets. Over time a leaky hot water faucet can waste a significant amount of hot water. Use the warm or cold settings on your washing machine as much as possible. Don't heat water when you are not going to use it. You can buy a timer which will turn your hot water heater off at night and back on again in the morning in time to heave hot water for your morning shower. Also when you are away on vacation you can turn your hot water heater off. Initiate even just a couple of these tips and help make your Charlottesville home more environmentally friendly. Lets work on making Charlottesville green! Visit my other blog Charlottesville Real Estate Talk for more information on Charlottesville and Central Virginia homes, events and real estate. Attend Wednesday’s free Green Matters Workshop and learn about what it learns to go green. This month’s workshop “Passive/Active Solar and Other Alternative Energy Sources” will be held on Wednesday October 8 at the Habitat Store at 1221 Harris St., Charlottesville. This will be the first part of a two part discussion of alternative energy options. Engineering, design, homeowner goals, technological trends and installation will be discussed. A social hour will be from 5-6 pm. Learn more about the Green Matters workshops. Interest in “green built” homes is increasing. In the Charlottesville area real estate market we are seeing an increasing number of Energy Star and Green Homes on the market. I would love to show you the homes that are available for the buyer who is concerned with their home’s impact on the environment. Visit my website Jump into Greener Pastures or read my blogs Charlottesville Real Estate Talk and Charlottesville Horse Farms and Country Homes. Albemarle County Goes Green – Should Albemarle County Allow Wind Turbines? Albemarle County could allow private wind turbines on private property within the next six months. At this time zoning in the county prohibits the installation of wind turbines. However the Albemarle Planning Commission is studying whether to permit small personal turbines at private county residences. These turbines may not be a cost effective way to generate power, but they could help with the reduction of greenhouse gases, which is a long term goal for the county. Whatever the commission decides regarding personal turbines, there will definately not be commercial wind farms in the counties future. Charlottesville, Virginia and Albemarle County have increasing numbers of green built and energy efficient homes for sale. If you are considering buying or selling a “green” home in the Central Virginia real estate market, contact me and I would love to discuss how I can help you with your real estate needs. Search the Charlottesville and Central Virginia homes for sale. Its August in Central Virginia and once again we need rain. In Albemarle County we have not had a significant rainfall for about a month and we are behind for the year. We are not at the point yet where the county has had to mandate water restriction measures, but it is still important that we all work to conserve this important natural resource. Are you aware of how much water you use? How many times do you leave water running? If you would like to calculate how much water you use go to http://www.csgnetwork.com/waterusagecalc.html and get an estimate of how much water your household uses. One easy way that we can all save water every day is to turn off the water when we brush our teeth. Depending on how long you run the water while you brush you can save approximately 1/2 to 1 gallon of water each time you brush. This could add up to 1,460 gallons of water saved in a year. If each of us would do this, think of how much water we could save. Lets all do our part to keep Charlottesville and Albemarle County green. Living Green – How Do I Measure My Carbon Footprint? Everyday in the course of our normal lives each of us is adding to the emission of greenhouse gases. One of the main factors changing the earth's climate is greenhouse gases. The choices that each of us makes in how we live our lives has a direct impact on how much carbon dioxide and other greenhouse gases are created each year. Choices in home construction, the foods we eat, energy consumption, what we buy and what we throw away have a direct impact on the environment. The Nature Conservancy has an online carbon footprint calculator designed to measure how your personal lifestyle contributes to the global climate. Click here to use the calculator. We are seeing an increase in awareness of how our home choices affect the environment. As a result we are seeing the construction of more "green" homes. If you would like information on energy efficient or "green" homes on the Charlottesville, Virginia real estate market, contact me. I would love to help you in your search for the perfect green home. Click here to search all of the homes on the market in the Charlottesville area.